The periphery banks are now inextricably tied to the path of their nation's sovereign debt. One of the things that made the Greek bond restructuring so difficult was the fact that the Greek sovereign bond write-down instantly made Greek banks insolvent. Greece had to use €50 billion of the EU financing just to recap the banking system. This issue has become acute in other Eurozone nations. Take Italy for example. 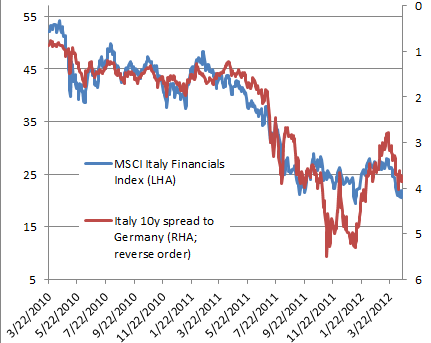 Sovereign spreads have been highly correlated to the valuations of Italy's financial firms. The amounts of Italian government debt these firms have been purchasing is quite staggering. 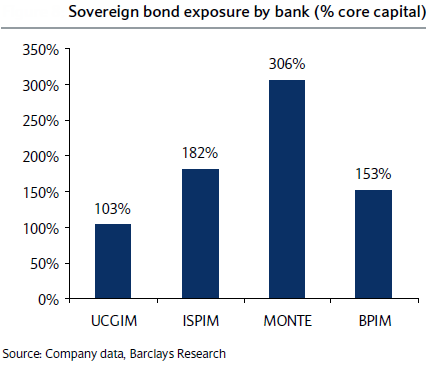 If you look at the largest Italian banks, the amount of sovereign debt they now hold represents a significant part of their balance sheets. Unicredit, the largest Italian bank that is relatively well capitalized, holds its core capital equivalent in sovereign bonds. Banca Monte dei Paschi di Siena holds three times the capital. 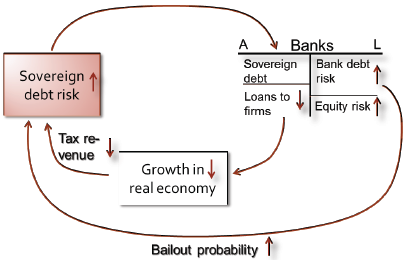 This process effectively ties banks and the government into a cycle of maintaining each other's solvency, creating a fairly nasty feedback loop. 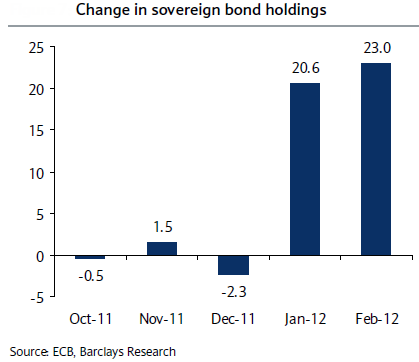 The challenge for the Eurozone periphery in the long run will be trying to unravel this linkage. Otherwise the "real economy" does not stand a chance of resuming growth.